Bird ID and shape: Common Grackles, two males and a female, fly in the nonbreeding season. The males are holding their tails tightly closed. Art by David Allen Sibley. The overall shapes and proportions of birds provide important clues to their identity. 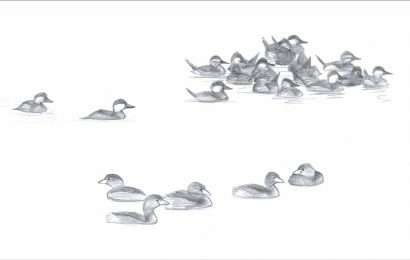 In fact, as birders gain experience, they rely on shape more and more. The subtle clues form the basis of subconscious recognition that allows us to identify a species at a glance. As we gain experience, we also come to learn that such clues can be misleading. Shape varies from individual to individual, as well as from moment to moment, as a bird’s attitude or behavior changes and as our angle of view changes. Another source of variation is less well known: that a bird’s shape can change with the seasons. 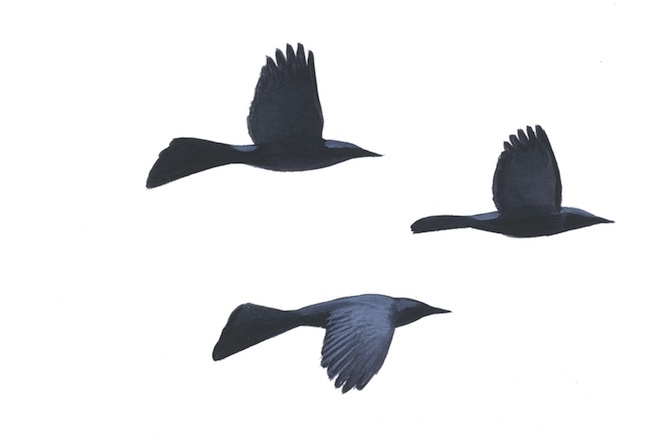 The illustrations on this page show seasonal changes in the typical shapes of Common Grackles in flight. 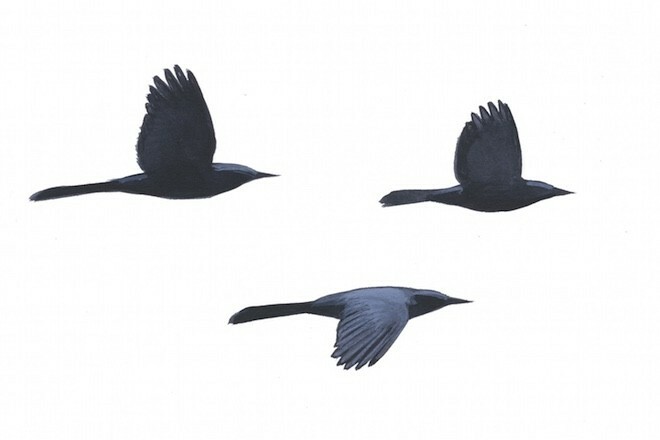 The image above shows three grackles, two males and a female, as they would appear in the nonbreeding season, about September to February. The image below shows the three birds as they would appear in the breeding season, about March to July. Common Grackles, two males and a female, as seen during the breeding season. The males are flying with characteristic keel-shaped tails. Art by David Allen Sibley. In this case, the feathers don’t change, but the way the grackles hold them does. In the nonbreeding season, males hold their tails tightly closed and streamlined in flight. During the breeding season, however, they fan their tails, making the unique keel shape. The tail forms a broad triangle. 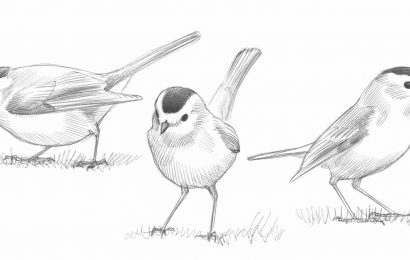 Problems arise from the selective way we birders form mental impressions of shape. We have a tendency to remember only the most obvious and distinctive shapes. If we fail to realize that shape changes with the seasons, our impression of the “typical” Common Grackle will be anchored in its appearance during breeding-season courtship flights, when the tail is spread into a wide triangle. Then, when October comes and we see a grackle flying with its tail closed, the identification might give us pause. This is but one conspicuous example; there are many others. The head shape of male ducks, for instance, can change when they are in a courting mood. Usually, as in the case of the grackle’s tail, the result is a more extreme and obvious expression of features that were there all along. Hawks, swallows, and other birds have distinctive flapping styles and wing postures that they use when courting. 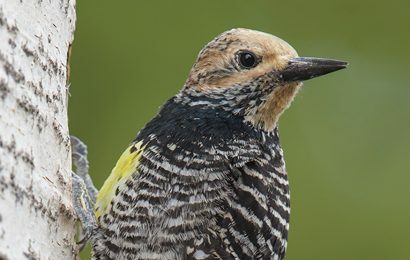 Watching for differences in shape as the courtship and nesting season begins can help you appreciate the subtle changes, and also give insight into birds’ life cycles. 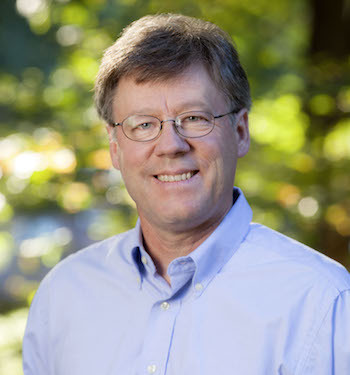 This article from David Sibley’s “ID Toolkit” column appeared in the January/February 2017 issue of BirdWatching.